Two-time premiership winning captain Gerald Ugle finished his 100th game in stellar conditions on home soil at Bendigo Bank Stadium on Saturday, with an 18-point victory over Swan Districts. Peel Thunder’s win kept the finals dream alive finishing 10.18 (70) to 9.6 (60). Ugle was welcomed on field with the applaud of friends, family and team mates, as son Cade and daughter Summer ran alongside their dad through the celebratory banner. Ugle’s wife Shiana sat front row with their two children and family to watch on as the game came to a narrow win with Ugle kicking a goal in the final minutes to seal the deal. She said Gerald felt the pressure heading into his hundredth game. “Yes, he was very nervous because he knew all the family were coming down to watch him and it was a very surreal feeling reaching his 100th game… It’s a big thing”, she said. Gerald Ugle started his football career at 15-years-old after winning the reserves best and fairest award. After that his career kicked off at AFL level playing three games for the GWS, then returning to Western Australia at the end of 2013 to join the WAFL. “After playing for the GWS he moved back to Perth to play for the Demons, but then he made a split decision to join Peel down in Mandurah,” she said. The Ugle family made the move down to Mandurah in 2014 which has proven to be a victory on and off field for Gerald. Shiana said the move from Perth to Mandurah was a big change for the family. 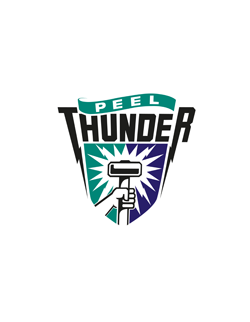 Ugle has not missed a game since joining Peel Thunder in the 2015 season, playing all 79 matches. In 2016 he was appointed captain of the team leading them to a winning success in their last two years. Shiana said the children don’t understand the gravity of their dad’s footy skills just yet but enjoy watching him play. “They are still a little young but always love watching him play, they love telling the kids their dad is the captain of the Peel Thunder team”, she said. While Ugle celebrates his 100th WAFL match, Shiana revealed their son Cade has just begun his first season playing footy. “Footy is his life, everything we do now is for his footy, his work schedule is great because it allows him to get to footy training on time,” she said. The footy crazed family still pray that Ugle has his second wind with the AFL, but have no major plans on moving away from Peel Thunder for the moment. “I don’t really know, we always hope that he [Ugle] will get picked up again, but for now we are happy here and Gerald loves being captain here, and we love Mandurah,” she said.